If there’s one dish I like to think of as my very own, it’s this one. No, I didn’t invent this combination of flavors or the idea of a savory pie, but I’d like to think I discovered tomato pie, finding it in a remote tea house and then spreading its legend to my friends in the world beyond. Among the friends I’ve served it to, no one has ever heard of such a thing as a tomato pie before, but invariably people love it. Back when I was fresh out of college and wondering what to do with myself, I took a job teaching at a boarding school in Northwest Connecticut. Although much of Connecticut is pretty suburban, or even urban, the upper reaches of Litchfield County, just steps away from the New York and Massachusetts borders, remain practically rural. Admittedly, it’s very upscale rural, with gorgeous farmhouses converted into mansions and quaint main streets with pricey shops, but as of 2000 there were no cell phone towers within range and the biggest safety issue was hitting a deer while driving on a dark night. Sort of a strange place to find yourself as a 22-year-old ex-New Yorker, but the other young teachers and I did our best to explore and dig up the best of what the area had to offer. One of our favorite finds was a little tea house called Chaiwalla, nestled off of the main street. With window seats, throw pillows, and soft lighting, no man would be caught dead in the place, but the girls and I could think of no better way to fill an afternoon than chatting over a pot of warm, creamy tea at Chaiwalla. At the time, chai wasn’t ubiquitous, the way it is now, and my introduction to the gently smoky, spicy tea, served in big clear glass pots atop tiny candles, was a revelation. I loved the tea alongside Chaiwalla’s homemade scones with lemon curd, but no doubt the showstopper of the teahouse was the tomato pie. Think layers of sweet, ripe tomato slices with fresh basil, gooey cheese, and a warm biscuity crust and you’ll start to understand the simple, rustic allure of tomato pie. This is my entry for Weekend Herb Blogging, hosted this week by Susan, from one of my favorite blogs, “Food Blogga”. 1. Preheat oven to 400 and lightly grease a 9″ pie pan. 2. To make the crust, place flour, baking powder, and salt in bowl and cut in melted butter until mixture becomes coarse and pebbly. Add enough milk to make the dough medium-soft. 3. Place about half of the dough on a floured board and roll to fit pie pan. Cover dough with tomato slices. Sprinkle basil and chives over tomatoes. Top with half of cheese, and coat thinly with mayo. Add remaining cheese. Roll remaining dough thinly enough to fit over the top of pie and pinch closed. 4. Bake approximately 20-25 minutes until brown on top. 1. You don’t have to peel the tomatoes (and in fact I didn’t this time), but if you don’t want to deal with skins, try blanching them by making a shallow X on the bottom of the tomato. Then dip them in boiling water for about 30 seconds before immersing them in an ice bath- the skins should come off very easily. 2. If you don’t have chives, no worries. I’ve been known to use dried chives or no chives at all on occasion and it doesn’t make much of a difference. 3. If you’re a mayo hater like me, feel free to reduce the quantity a bit (to, say, 1/4 cup) and if you mix a little lemon juice into the mayo it liquifies it, making it much easier to spread so that you don’t end up with any clumps. Oooooh, I’m bookmarking — this looks absolutely delicious. Sounds just delicious. This has all the flavors I love. I have to admit though, the idea of actually making a pie scares me to death. I’ve only made pie a couple of times in my life! Tomatoes, basil, chives, and cheese? It doesn’t get much better than that. Oops, wait a minute, my husband, who just handed me a cup of coffee, looked at your photo, and said, “Wow, it’s the crust that really puts it over the top.” 🙂 So, I guess I’ll be making this recipe soon! Thanks for a the delicious entry, Emily. Being one of the friends introduced to tomato pie by Emily, I can attest that it really is great! And this particular one is seriously good looking. Maybe your best ever, Em. I wish I was there to help eat it. 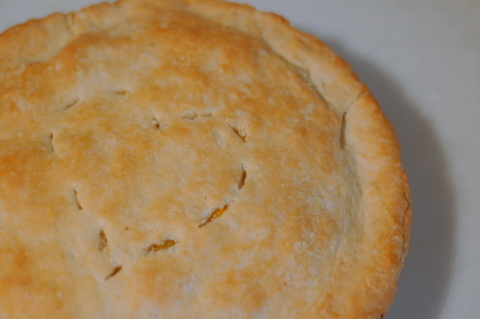 Kalyn- If you ever wanted to try a pie, this one is easy as can be! I’m not a regular pie maker either, but have never had a problem with this one. The crust rolls out really easily and you can even patch it together if you don’t roll it out to the exact size of the pie pan…can’t say it’s Atkins friendly, but it certainly is delicious! Oh goodness, that looks absolutely fabulous!!! I can’t wait to try it. mayonaise eh? thats an interesting twist. mmm, tomatoes all baked in a pie, sounds fabulous! 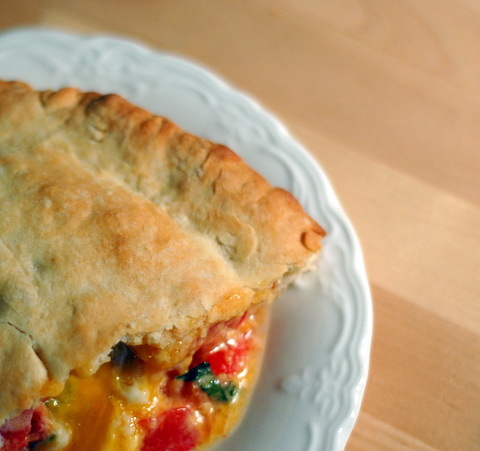 I made the tomato pie today and can attest that it is simple to prepare and simply delicious! The fresh basil is the “magic” touch that makes the flavor soar. I heartily recommend this recipe. Thanks! You made my day…and my dinner!!! Now, I haven’t looked through your blog to ensure you aren’t vegetarian, but we’ve eaten tomato pie for the past few years with crumbles of bacon. You’d think you’d died and gone to heaven. It’s tomato season again & I resurected this recipe. Superb!! It’s my favorite – and soo easy to make, even the crust (I’m also not a very good ‘crust maker’ – though I do it.). Sharing this recipe today with the friend who shares their tomatoes with us! I mix the mayo with the grated cheese & like the way it spreads better. Sometimes I sub regular onions. And I have doubled (at least) the tomatoes with good results (two and three layers of med. thick slices). Thanks! I had a bet with a friend and she said that there was no such thing as a tomato pie. You proved I was right. Thanks! I do enjoy the way you have framed this specific issue plus it does indeed supply me some fodder for thought. Nonetheless, because of everything that I have experienced, I simply wish when the commentary pack on that people continue to be on point and don’t get started on a tirade involving some other news of the day. Yet, thank you for this excellent piece and though I can not really agree with the idea in totality, I value the viewpoint. I wonder what it taste? Looks delicious.